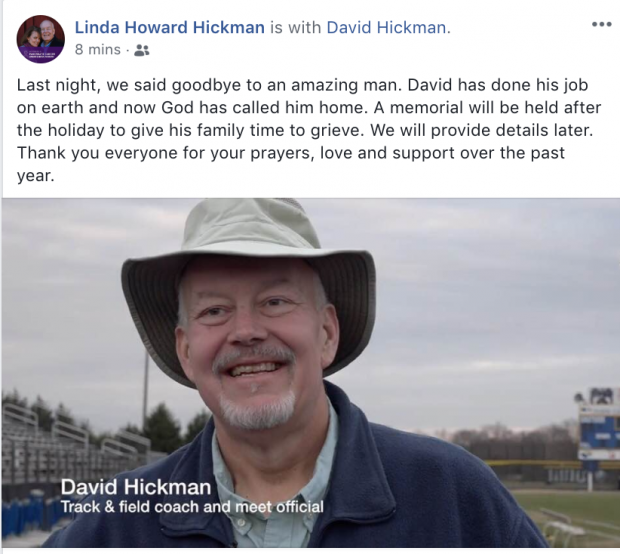 Longtime coach and meet official David Hickman passed away Dec. 17 in the evening after over a year battle with cancer. The SCTCCCA said in a statement: The South Carolina Track and Cross Country Coaches Association is saddened by the loss of Coach David Hickman, longtime track coach at Blue Ridge, Eastside and Riverside high schools, who passed away Monday evening. The SCTCCCA offers its condolences to David's family and friends. David has been a long standing active member of our association, and a dedicated official for track and cross country events across our state, serving as the starter and assistant starter for the Coaches Classic and State Track and Cross Country meets for the past four years, including the State Championships in Cross Country this past November. David will be fondly remembered and dearly missed by the track and cross country coaching community. What is David Hickman's motivation? David Hickman: What is athlete success? David Hickman: What challenges do you encounter? I remember the first time we met, Coach. Eastside high school when I was in middle school. You told me to go with the Emerald girl and I did. I have no idea why, because it was my first year running and I was scared out of my mind, but 5 and 1/2 years later, you've been one of the reasons Ive kept running. Anytime I would want to quit and go home, I thought about you always supporting me at every meet. I have no idea how the M&M joke started, but I'll forever have the packs stocked in my room because of you. I don't think you ever realized how much that meant to me. Things like that change someone's life. You really did change my life. You believed in me through everything and I never had to worry when I got up at 5 am for meets. The stress I had didn't swallow me because I knew I was on the way to see you and hear your pep talks that washed away any bad feelings I had. During the mile and the two mile, I didn't have to count my laps. You were there to shout them out and tell me my next move. If I cried after a race, you were there to hug me and remind me that it was just one race. You always had the best hugs, Coach. I hope you know, you not only have changed my life, you've changed every single persons you've met. I can promise you that no one has ever met a stronger, more selfless man than yourself. I don't want to do track without you. I don't want to miss the facebook posts that make me smile every day of the week. But I know you're with me. My wish in my Shrine Bowl interview was to take you, Coach Wyatt, John Olson, and Coach Smith with me to college. One of those is true. You are going with me to college and every single place I go. I love you, Coach Hickman. More than you will ever know.